This article deals with rivers in Kerala. PSC questions related to rivers, dams, waterfalls and hydroelectric projects in Kerala can be easily answered once you read this short notes and study materials thoroughly. This post is written in continuation with study materials on the geography of Kerala which is according to the syllabus of most of the Kerala PSC examinations. This will be helpful for assistant engineer exams, KAS exam, deputy collector exam, LDC, Secretariat assistant exam, lecture exams etc. While reading this article, try to remember the words which are given in bold letters so that your learning process will be easier. Short notes for rivers in Kerala are as follows. Kerala is popularly known as the land of rivers, lagoons, and backwaters. Western ghats are the originating source of all major rivers of Kerala. However, there is no river in Kerala similar to great Indian rivers like Ganga and Brahmaputra which runs more than 300 Km. According to the government of Kerala, a water channel which is more 15 Km long is considered a river. In this regard, there are 44 rivers in Kerala. Among this 41 are west flowing rivers and 3 are east flowing rivers. The 3 east flowing rivers in Kerala are Kabani, Bhavani, and Pambar. All the east-flowing rivers in Kerala are the tributaries of Kaveri river. Kabani is flowing through Wayanad and into Karnataka. Bhavani and Pambar are flowing into Tamilnadu. Kerala has 11 rivers which are more than 100 Km long. Muvattupuzha is the river which flows through most of the districts in Kerala. It is flowing through 4 districts. In Kerala, most of the rivers descents into the Arabian sea. Periyar and Bharathapuzha were the only two rivers in Kerala which are having a length of more than 200 Km. There are 4 rivers in Kerala which are having a length of more than 150 Km, they are Periyar, Bharathapuzha, Pamba, and Chaliyar. The rivers which are having a length of less than 20 Km in Kerala are Ariyur river (17 Km), Ramapuram river (19 Km) and Manjeshwaram river (16 Km). Some of the important rivers of the 44 rivers in Kerala are discussed below. The rivers which are not mentioned here are not that important for Kerala PSC examination. It is the longest (in terms of length) and the largest (in terms of volume of water) river flowing in Kerala. Periyar is known as the ‘lifeline of Kerala’. It originates from the Sivagiri peaks of Sundaramala hills in Tamilnadu. Periyar also holds most of the hydroelectric projects and dams in Kerala. Idukki dam, which is the largest hydroelectric project in Kerala lies on Periyar. It flows through the districts of Idukki and Ernakulam and fell into Kodungallur lake (Arabian sea). Periyar is also known as ‘Aluvapuzha’. It divides into Marthamdan river and Mangalapuzha from Aluva. Chourni is the old name of Periyar which is mentioned in Arthasasthra. Nowadays, the lower reaching of Periyar is highly polluted. The industries in Eloor industrial zone discharge waste into Periyar. Aluva, Kaladi, Malayattoor, and Neriyamangalam are some of the famous places on the banks of river Periyar. It is the second largest river in Kerala. It flows about 209 Km in Kerala. Bharathapuzha originates from Anamala hills in Western Ghats of Tamilnadu and flows westwards through Palakkad via Coimbatore. Kannadipuzha is one major tributary of Bharathapuzha and it is also known as Chittur river. Kunthipuzha, which is a tributary of Bharathapuzha flows through Silent Valley National Park in Kerala. It is the least polluted river in Kerala. Bharathapuzha flows through Palakkad, Thrissur, and Malappuram and also known as Nila. It flows into the Arabian Sea at Ponnani. In Chittur, Bharathapuzha is known as Sokanasini. This name was given by Thunjath Ramanujan Ezhuthachan. Malampuzha dam is the largest dam built across Bharathapuzha. Kerala Kalamandalam (Cheruthuruthy) is situated on the banks of Bharathapuzha. Thirunnavaya, a place which is famous for ‘Maamangam’ is also located on the banks of Bharathapuzha. It is the third largest river in Kerala. It was known as Baris in the olden times. Pamba runs for 176 Km. Pamba is also known as ‘Dakshin Bhagirathi‘ because of its association with Kerala’s largest pilgrimage center – Sabarimala. Sabarimala is located on the banks of Pamba. Pamba originates from Pulachi Malai hills in Peerumedu plateau in western ghats and it falls into Vembanad Lake. Punthenaruvi waterfallsis a famous of its kind is located in Pampa river. Kuttanad is known as the ‘Gift of Pamba river‘. Kuttanad is well known for its paddy fields and geographical peculiarities. It is the region with the lowest latitude in India and one of the few places in the world where farming is carried out below sea level. Thottappally spillwayand Thanneer Mukkam barrage were constructed for the protection of Kuttanad. Kuttanad is also known as the rice bowl and fishbowl of Kerala. Lord Curzon called Kuttanad as the ‘Netherlands of Kerala‘. Achankovil, Pamba, Manimala, Meenachil, Muvattupuzha are the main rivers flowing through Kuttanad. 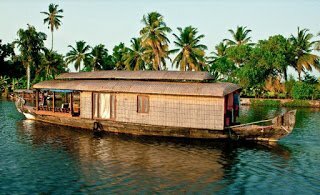 Kuttanad is also famous for backwater tourism. Sabarigiri hydropower project is in Pamba river. It is the fourth largest river in Kerala. It is also known as ‘Bepoor Puzha‘. Gold extractions in Kerala were found on the banks of Chaliyar river. It flows through the teak forests of Nilambur (Northern part of Kerala). Iravazhinjipuzha (Famous for the movie “Ennu Ninte Moideen” – flowing through Mukkam and also mentioned on the famous novel ‘Nadan Premam‘ written by S K Pottakkad) is a tributary of Chaliyar. Nilambur, Idavanna, Mavoor, Ferok, Bepoor are some of the famous places on the banks of Chaliyar. It is the fifth largest river in Kerala. It is the river in Kerala which is having the most fish resources. Parambikkulam, Kuriyarkutti, Sholayar, Anakkayam are some of the major tributaries of Chalakkudi river. It is the largest river in Kerala which joins to any other river within Kerala. The 130 Km long Chalakkudi river joins to river Periyar. Peringalkuthuand Sholayar hydroelectric projects are some of the famous of its kinds constructed on Chalakkudi river. Famous waterfalls like Athirappallyand Vazhachal are located on Chalakkudi river. Kabani is the longest east flowing river in Kerala. It is flowing through Wayanad district of Kerala and into Karnataka state. Banasura Sagar Dam and Kuruva Island are located in Kabani river. Panamaram, Mananthavadi, Noolpuzha and Bavali river are some of the major tributaries of Kabani river. It is also an east flowing river which originates from Tamilnadu, flows 13 Km through Kerala (Palakkad) and again flows backs to Tamilnadu. Shiruvanipuzha (which runs through the Attappadi) and Varagaru are the major tributaries of Bhavani. It is the smallest east flowing river in Kerala (Idukki) which flows into Tamilnadu. Pambar originates from Devikulam in Idukki district of Kerala. It is also known as ‘Thalayar‘. Pambar is the river which flows near the Eravikulam national park. Mailadi, Eravikulam, Theerthamala, Changalar, Thenar are some of the tributaries of Pambar. Pambar and Thenar join at Tamilnadu and forms Amaravathi river which is a major tributary of river Kaveri. Thoovanam waterfalls which are inside Chinnar wildlife sanctuary are in Pambar river. Manjeshwaram river in Kasargode district is the smallest and northernmost river in Kerala. Neyyar (flowing through Thiruvananthapuram) is the southernmost river in Kerala. Neyyar falls into the Arabian sea near Poovar (a place in Thiruvananthapuram district). Kasargode district accommodates most number of rivers in Kerala. Chandragiri puzha is the river flowing through Kasargode town. Mayyazhipuzha (Mahe river) is known as ‘English Channel of India‘ from the period of Britishers. Kuttiyadi river is known as the yellow river of Kerala. Kalladayar is one of the major rivers which fall into Ashtamudi Lake. Kulathupuzha and Chenthuruni river are the main tributaries of Kalladayar. Punalur, Pathanapuram, and Kunnathur are places located on the banks of Kalladayar. Palaruvi waterfalls are in Kalladayar. The river which is mentioned in the Booker prize-winning novel “God of Small Things” by Arundhati Roy is Meenachil river. Kottayam, Pala, Punjar, Erattupetta, Ettumanur are some of the famous places on the banks of Meenachil river. Karamanayar is the river which flows through Thiruvananthapuram city. Aruvikkara dam, which is the source of drinking water for the entire Thiruvananthapuram city is built on Karamanayar. Korappuzha differentiates northern Malabar and southern Malabar. Payaswini river in Kasargode borders Tulunadu and Kerala. Erumeli, Mundakkayam, Mullappalli, Niranam are located on the banks of Manimalayar. Thodupuzhayar, Kaaliyar and Kothayar meets at Muvattupuzha. Vaikkom and Piravam are places located on the banks of Muvattupuzha.